Tamana Slathia works for peace and gender equality, one person at a time. Here is her story. I was born in Gurha Slathia, a homogenous village hamlet in a district in Jammu that borders Pakistan. With very little (almost no) diversity around me, the only ‘other’ persons I saw in my village were from nomad communities called Gujjar-Bakarwal who camped in the jungles outside the village during summer and would walk into the village for odd jobs. Soon after, my parents moved to a town for my education and I spent the initial formative years in Samba (the name of the town) in a convent run by nuns from Kerala, reading about the world and discovering different cultures. For the little sheltered me, it was a world straight out of Enid Blyton’s books, with always something new to discover. Since it was a border district, there were different army camps and so one could hear foreign languages and observe different festivals. There were also many kids from the border villages who had to travel hours to the school and back, with periodic interruptions in their education by cross-border firing and the looming war. When I was seven years old, during the 1999 Kargil war, overnight, we saw migration of all the people from all border villages of Samba into the schools, hospitals, town-hall and industrial complex of Samba. All day we would hear firing and shelling and it only got worse during the night when we had to observe blackout against possible aerial attacks. My father decided to take me to the make-shift camp the next day so I could see for myself what war does to people who never chose it. I saw families who could only escape with a couple of bundles of clothes. I saw old matriarchs crying over their killed/abandoned cattle which were like family. I saw kids wailing, unable to understand why they had to leave the comfort of their aangan onto the roads as their playground. My father also walked us during the early morning hours, when the cross border firing was lesser, to as much safe distance into the border area as was permitted and in the thunderous sound of bombs and cruel robotic motion of machine guns, I felt a tiny part of the terror that most of my fellow citizens lived with, in terrifying distance of, all year around. That couple of months changed me. I became more compassionate and started asking questions about the wars gone by. I asked every old person was willing to talk to a curious 7 year old and carried their stories in my tiny heart till the burden began to scare my family. A few years later, my parents moved to capital city Delhi for better education and opportunities for us and the more I immersed myself in the fast-paced city life, the more distant I grew from my roots and my home state. It was emotionally traumatic and led to an identity crisis. I was an outsider for both the places now and yearned for familiarity. My experience also made me more sensitive to the issue of migration in the state as I am aware not everyone has the same means and privilege that I experienced. It also led me to advocate for equal opportunities for Refugee and Internally Displaced Communities. On a brighter side, education in Delhi was a different and cherished experience. No one asked my caste, my religion didn’t matter. I had friends from almost every community you can imagine in Delhi and never ever were we reminded of our backgrounds. It definitely forms an important part of who I am today and I dream of similar education for the kids in rural Jammu and Kashmir. If there is a learning experience that comes close second to my education in Delhi, it is my work at the American Indian Foundation(AIF). It’s a truly inclusive organization where I have seen my intersectional dreams manifest. In spite of being the youngest at AIF, I was treated at par with any senior person and was listened to and asked for my opinions. It still positively guides my leadership behavior. It was a coincidence to stumble upon formal peacebuilding work. 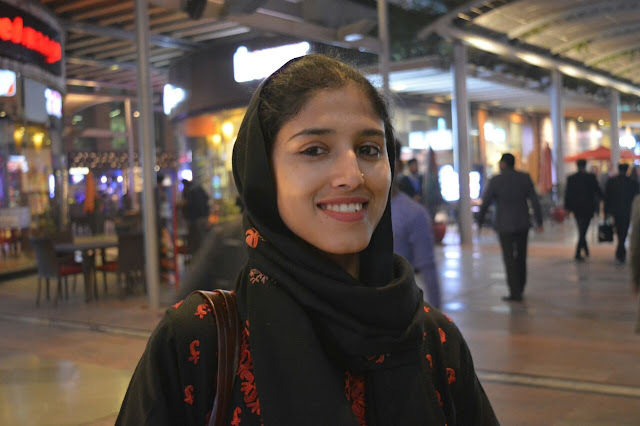 When I returned to Jammu, after completing my school education, I faced many personal struggles that led me to pursue peace and work towards it and then, as I began volunteering in Jammu and Kashmir, the circle of my peacebuilding work expanded from myself to my community to regional dialogues and finally working with the global community. I am from Jammu region but it is a blessing that my peacebuilding work began by being informed by the perspective of Kashmir region and later came to be guided by the aspirations of the youth from Ladakh region. This experience has given me unique and well-informed insights into conflict in J&K which I use to periodically analyze conflict in J&K and design innovative youth-led interventions. My extensive immersion in different cultures and communities has been the major factor in shaping up my work. Inclusion and Fair Representation and Participation has been consistently guiding my activism. I still make it a point to speak for all and create space for others and this is the same value that guides our organization’s work. In the process of listening to others and bringing communities together, I found myself bridging gaps, building peace and striving to transform conflict. In between all of this, it has been a steep learning curve. At the time I began working as a peacebuilder, without resources that were accessible and within reach, it was a huge task to take on. I still struggle with limited resources but at the beginning it was harder also because I was young and a woman, both assumed not fit to lead by my community. With my success story and that of many more extraordinary young women leaders from my state, it has definitely changed now. The only way I was able to achieve my goals and continue my work despite challenges was through community-led initiatives and mindful partnerships. I began approaching everyone with similar vision and mostly youth-led and educational institutions have been really enthusiastic partners. I have also had a huge support from the international peacebuilding peers and community especially by sharing learnings and broadening our perspectives. I had a negative and limiting mentoring experience early in my work and that has guided my path as well. I learned to pass on knowledge, opportunities as well as decision-making faculty to other young people especially from underprivileged backgrounds and that defines our collective work now, as I proudly see these young people leading their own communities and peers. Young volunteers at my organization(s) have been carrying on the work selflessly and that has been the biggest reason for our achievements as well as the result of our work. I Will Go Out has been a defining point in my career and my life. It’s a space that is so open and accessible, truly led by the community with no rigid, centralized decision-making. I recommend everyone to study the model of leadership that IWGO follows/has created because it is a truly empowering and flowing space. It’s an organization led by women from diverse backgrounds with the aim of reclaiming equitable access to public spaces. What began as a nation-wide march to reclaim our right to go out (hence the name) in response to the mass molestation on New Year’s Eve on the streets of Bangalore in 2017, now is stronger with allies in more than 35 cities in India. We have expanded our work to reclaim safe access to digital, political and other spaces that still exclude women, LGBTQIA+ and other minorities. Digital activism is complimented well by periodic implementations on ground, through collaboration. It’s very easy to see how IWGO has shaped much of my own principles of leadership and work, and it is similarly reflected in most of our members. Personally, after associating with IWGO, I discovered more about Feminism, recognized internalized patriarchy, regulated my language to be more inclusive and keep learning everyday from the women who make IWGO. I love how everyone is welcome, there are no silos and barriers, and information is freely available. Opportunities flow freely as networks expand and that’s such an empowering space for women to be in, like a utopian sanctuary but it exists! Young women in conflict are perceived as Vulnerable and Weak, in our context. In my own community, it was an unexpected choice and one that did not go well with others. I was working for different communities to come together and that did not go down well with my own community male members, specially because it went against the popular cultural norm for a woman to choose anything that the (young) males in the community have an aversion to and the fact that a young woman, who was unapologetically vocal about being a feminist, was leading in spaces that were inherently male-dominated. I have learnt over time to balance ignoring and engaging people who troll, counter Feminism or misunderstand it. However, a conscious decision has been to gender mainstream the peacebuilding work. We’ve developed a gender lens for all our activities and workshops. Gradually, our whole program has come to be led by young women. Most importantly, we’ve achieved a gender balance in all our leadership trainings. I do realize that not everyone who is vocal about their ideology feels safe and protected, so I made the organization as well as my social media handles a safe space for young feminists to discuss, explore and share. I recently got an opportunity to lead a group on Countering Violent Extremism, all young men, 20-21 years old, from diverse backgrounds and was pleasantly surprised to find them all gender-neutral. It was a strong contrast to my usual experience and further reiterated that peace and gender equality are mutually inclusive. Throughout this journey, I have been blessed with experiences that continue to shape my personal practice of peace as well. One such defining moment in my work was when while travelling by road to Kashmir, we stopped at a vehicle repairing shop and had a conversation with the owner and his family, who told us of his aspirations, his expectations from the new government in India and it wasn’t much different from the last person in every village of India. However, in the regional level as well as the global platforms, his voice is not represented nor is heard. I knew exactly what it meant to be invisible and it defined for me why I still continued doing what I was doing. It hasn’t been an easy journey but every time I think of giving up, my thoughts go back to that man and I am reminded of his aspirations and expectations and how the conflict has blanked them out. As someone who has been born and lived in Jammu and Kashmir (or Jammu, Kashmir and Ladakh, as I would like to call it), I have observed that conflict in J&K is multi-layered and multi-faceted. While the international community sees it as an issue of dispute between India and Pakistan, what the common people deal with everyday in J&K is inter-regional conflict, cross-border firing, infiltration, terrorism, violent extremism, divides between ethnic groups and that is not all. Efforts to transform conflict and build peace have been guided by non-local (and often single) narrative which isn’t going to work unless the importance of local actors and potential of young people from different and all communities of the state is recognized and used. Peace in the state has to be built up from the community. One direct impact I can vouch for is that young people in the state found a platform which was free from discrimination and labels and were able to form and sustain cross-regional and cross-cultural bonds that have grown stronger with time. They have led their communities and younger friends to look beyond boundaries and sown seeds of reconciliation. I have witnessed many beautiful stories of change but the one that is special is a visit I organized of youth from different districts of J&K to my own village, as part of countering single narratives in the state. That day, I saw the world change as my own perceptions were knocked down. The gathering was held in an ancient temple premises that also served the purpose of community space. The group was distinctly diverse, something unusual for the village. However, the villagers especially elders welcomed the group with such warmth and forged enviable friendships, listening to each other’s stories, sharing anecdotes, discussing each other’s insecurities and finding common elements in their different cultures. The perceptions, pre-conceived notions of the ‘other’, stereotypes about the communities, all came crashing down under the weight of loud laughter and happy conversations. The two groups were not just closer but also wide awake about the danger of believing a single story. Many participants wrote (and still write to me) about the learning from the visit and how it continues to guide their pursuit of dialogue and peace in their communities and interpersonal relationships. I used to think it would be an achievement to be able to brighten up just one life but this work has gifted me the privilege of watching the world change for the better, day-by-day and person-by-person, including myself.